Studio 804 is a team of graduate students working towards gaining their masters in architecture in the Architecture, Design, and Planning program from the University of Kansas. Studio 804 has been in existence for sixteen years and has consistently designed and produced sixteen projects during that time. Each year, in their final year in the program, Studio 804 project consists of spending the fall semester creating the design, identifying the needs and goals, estimating the cost, and locating the materials needed. 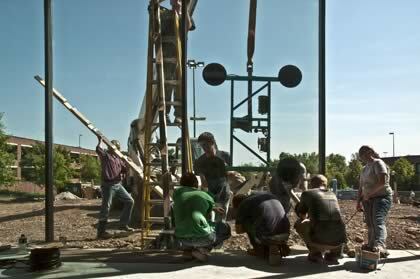 The spring semester is dedicated to the construction of the structure. Dan Rockhill, executive director of Studio 804 and professor of architecture at KU, oversees the project in its entirety and guides the students as they learn what it takes to take a design from conceptualization to completion. This year’s project, “Galileo’s Pavilion,” was designed to enhance the sculptural piece “Galileo’s Garden” designed by Dale Eldred. It is a three room structure consisting of two class rooms and one collaborative space. The structure was designed using passive solar building principles and includes three green wall systems. A bulk amount of the materials used for the project was reclaimed materials. 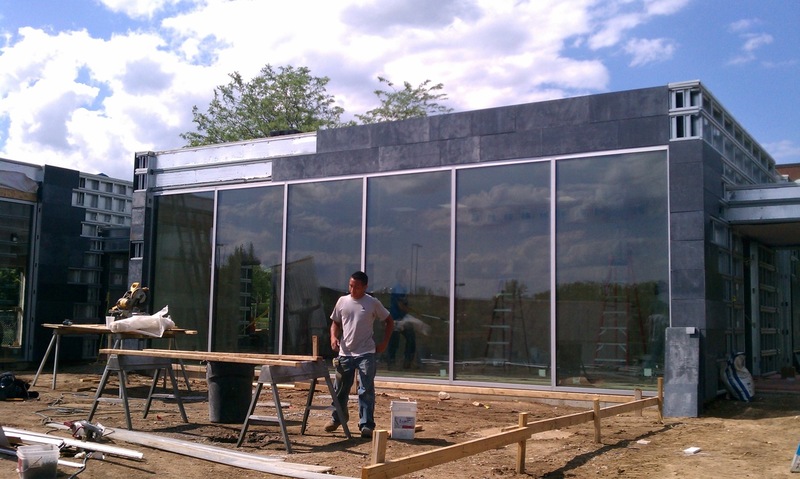 Reclaimed slate from school chalkboards was used for the exterior siding and the storefront glass used for the project was recycled from a canceled commercial project. Resourcing reclaimed materials for the project assisted in gaining additional LEED points, cut the cost of the project, and kept those materials from being otherwise being dumped into a landfill. PlanetReuse assisted in the outsourcing of the glass material for the building. The glass was salvaged from a Moshe Safdie commercial project that was started and cancelled in the Plaza Area of Kansas City, MO. 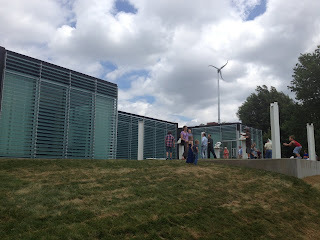 Galileo’s Pavilion is a response to Johnson County Community College’s goal for sustainability. Though it has not been achieved, it is set to gain a LEED Platinum rating. This will be Studio 804’s fifth LEED Platinum building and the 4th LEED Platinum building in Kansas (the others which are located in Greensburg). 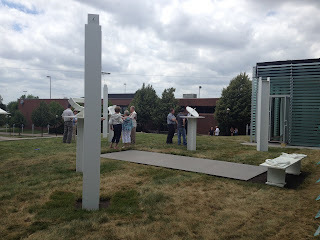 Congratulations to Studio 804 on their accomplishment and completion of "Galileo's Pavilion."